Muscle building foods that will help you to add the right kind of muscle mass fast. 1. High Protein 2. Complex Carbohydrate 3. Low Fat / Good Fat. Many people wanting to gain muscle mass fast fast, look for (and rarely find) muscle building foods that have all three, that’s why experts recommend a combination of these foods as part of your full day muscle building food plan. This means you can get the best nutrients each of these muscle building foods has to offer. Use the combination of these top muscle building foods, and prime yourself to gain muscle mass fast. As a guide we recommend you follow the 60:30:10 rule, this means balance your muscle building foods throughout the day to ensure 60% is high protein, 30% is complex carbohydrate and 10% is from a good fat source. Chicken breast is the ultimate high protein muscle building food and is the most common protein found on the dinner plates (and in lunch containers) of bodybuilders, fitness models and guys wanting to build muscle mass. The breast is the best source of lean muscle protein as it has a higher protein-to-fat ratio (19:1) than any other part of the chicken. A 150g serve of chicken breast contains around 47 grams of muscle building high protein, is packed with amino acids, and low in fat and carbs making it an ideal muscle building food. Muscle Building Food Tip: Remove the skin from your chicken breast. For flavour, you can grill the chicken with the skin on, but remove before eating. Peanut butter is an essential muscle building food for mass gains that is calorie dense, packed with good fats and also contains muscle building high protein. Two tablespoons of peanut butter contains around eight grams of protein, which makes it a great muscle mass food. It also contains complex carbohydrates for muscle energy, vitamins and healthy fats. Muscle Building Food Tip: Try stirring it into your hot oats in the morning, putting it on celery for a snack or adding it to your post-workout smoothie. Cottage cheese is a great high protein muscle building food as it is rich in sustained release casein protein, low in fat and high in calcium making it the ideal high protein muscle mass food to have before bed. A twenty gram serve of low-fat cottage cheese contains around 10g of muscle building protein and also contains good bacteria that can help you breakdown and absorb all the nutrients you need to build muscle mass. Muscle Building Food Tip: Cottage cheese makes a great muscle building protein packed snack anytime served with fruit or on a rice cake. Vitalstrength Pro-Muscle Protein is a complete muscle building food that is high protein and packed with muscle building amino acids, contains complex carbohydrate energy to fuel your muscles plus it is low in fat and has added fat burners for optimum muscle building food results. 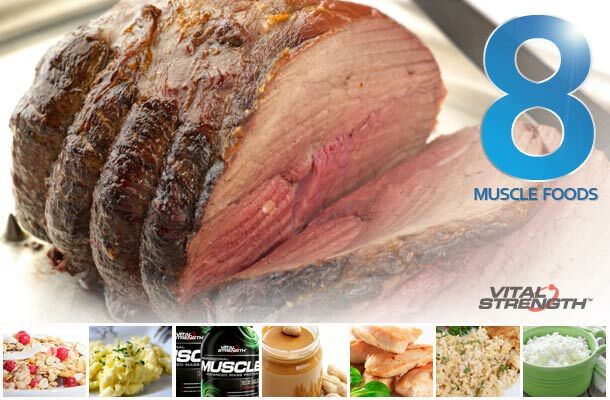 It has a 60 : 35 : 2.5 protein, carb and fat ratio (that fits very closely to the 60 : 30 : 10 rule) making it an ideal muscle building food to fit your macros. 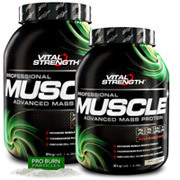 Vitalstrength Pro-Muscle is a premium high protein muscle building food chosen by bodybuilders, fitness models, footballers and guys at the gym who are looking for a muscle building food that packs all the key nutrients into one convenient meal rather than preparing on a combination of different foods. Muscle Building Food Tip: Vitalstrength Pro-Muscle Protein is a convenient muscle building food to have post workout and in between meals. Mix with 300ml of milk, stir into your oats in the morning or add to your muscle gain smoothie. Brown rice is a great muscle building food that is a staple carb for many bodybuilders and athletes. Brown rice is chosen as a muscle building food because it is a complex carbohydrate that is the “unrefined” version of white rice, providing a sustained release of energy to your growing muscles and mass gain results. It is a good source of fibre as well as magnesium, which are muscle building food properties that work with calcium to build bones and teeth and assist muscle growth. Muscle Building Food Tip: The ‘90 second’ microwave packets are the perfect muscle building food snack or meal, and can be used in multiple ways to help you build muscle mass. Beef is one of the best high protein muscle gain foods as it contains nine essential amino acids and has a high biological value, which means it can be easily digested and used by the body to build muscle mass. As a muscle building food, it is a major source of vitamin B’s, phosphorous, iron, zinc, and creatine all of which are important nutrients for a muscle mass food. Beef also contains some saturated fat, which can support healthy testosterone levels, and monounsaturated fat, for heart heath. Muscle Building Food Tip: Make sure you choose the right lean cut for all the high protein muscle mass food benefits without the unwanted fat. An egg is one of the most complete and versatile high protein muscle building foods available. It is a key muscle food for bodybuilders and anyone wanting to build muscle mass fast. An egg contains around 6 grams of muscle building food protein and essential amino acids needed for optimal muscle mass results. Eggs are also rich in vitamins, including E, A, K and a range of B vitamins for muscle energy and muscle building minerals like calcium, zinc and iron. Muscle Building Food Tip: For an ideal muscle mass mix try using a ratio of six egg whites and one egg yolk in your next omelette to reach a higher level of protein for your muscle meal. Oats are another staple muscle building food for bodybuilders and athletes looking to build muscle mass. Oats give you the energy to power through your training as they are a complex carbohydrate that have a low GI, meaning a long lasting supply of fuel. Oats as a muscle building food are also low in fat, high in fiber and contain essential vitamins and minerals for building muscle mass. Muscle Building Food Tip: Combining a good muscle mass food like oats with Vitalstrength Pro-Muscle Protein before hitting the gym in the morning will also fuel your body for an intense workout. Muscle Building Foods Tip: If you’re serious about building muscle mass, you should include a combination of these muscle gain foods in your muscle building diet every day.